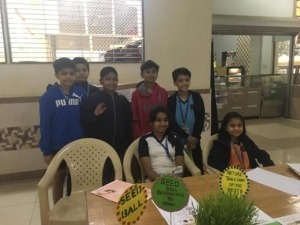 We are delighted to share a blog written by Manit Mehta, a student at Rustomjee Cambridge International School, India who is part of a team delivering a Global Goals project for the 2018-19 Global Goals Competition. Our team highly encourages schools in Mumbai to run similar workshops. The toddlers you train will become the SEED ambassadors to promise a brighter future. 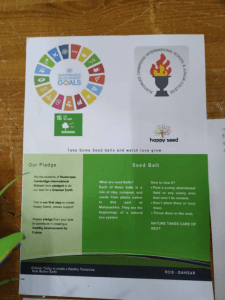 We, a group of seven children studying in Sixth grade at Rustomjee Cambridge International School ( RCIS) with the thought leadership and blessings of our very enthusiastic teacher Aanchal Miss and Principal Tanya Ma’am are set out to achieve United Nation’s Goal: Life on Land. Our mission is to make and sell as many Seed Balls as possible to have green and healthy environment around us. 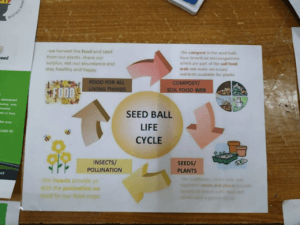 We arranged several workshops in the school pre-primary section and the toddlers, in fact, rolled over 500 seed balls to fulfill the orders we have already booked. A collaborative effort with our ninth graders to join forces on Grand Parents’ day. We are really excited to roll some balls with so many grandmas and grandpas around. We are sure they will be equally thrilled and excited to ensure a greener and healthier future for all of us. As a cherry on the topping, there will be a lot more to learn from these experienced hands. Yes, we took up the Global Social Leaders ( GSL) Global Goals Challenge in November and every day since then has been filled with fun, thrill, expectations, discussions, reasoning, exploring, enthusiasm and so on. Are these Seed Balls Skill Balls for us? Looking back, we can’t believe what we have learnt alongside this project: conceptualizing, designing, budgeting, fundraising, accounting, interacting, marketing, advertising, photography, art and craft, theatre skills, working with multiple age groups and most importantly team work and community spirit. Happy Seeds, indeed are growing in multiple trees!!! The journey so far: TEAM WORK and GOOD SPIRIT all the way…. The second step: Distribution of duties- educating the members, social media and photography, making banners and pamphlets, fund raising, arranging for raw materials and packing materials, designing and running awareness programs. Each one of us picked up the role that we liked. The fourth step: Making seed balls with the materials- Now started the real fun!! We sold the concept very well, raised funds and pre-booked orders and now is the time to deliver. 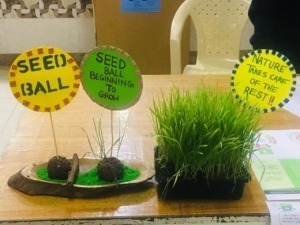 Our teacher and Principal ma’am came up with a very brilliant idea to rope in pre-primary kids to prepare the seed balls as a fun-learning activity for them. The fifth step: Awareness skit- Team Happy Seeds performed super animated skit and filled all the tiny tots with lot of enthusiasm. The toddlers were on the roll and in no time we could make over 500 seed balls. A parent of a fellow student met with us during the open house and has written a very flattering account of our interaction with her. All of us feel very proud and precious!